Since the beginning of industrialization in the 19th century, coal has had a significant impact on the world’s energy supply. To this day coal is still one of the leading energy sources among all non-renewable resources. The use of hard coal, the most important type of coal, has even increased somewhat share of total global energy production in a few recent years. Coal also has by far the largest reserves of all non-renewable energy resources. 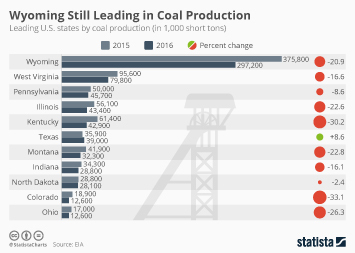 Global production of coal has been steadily rising in recent years, and reached the equivalent of over 3.7 billion metric tons of oil in 2017. The leading hard coal producing countries are China, India, the United States, Australia, and Indonesia. The largest company based on production is the Indian state-controlled Coal India Limited, which produced some 599 million metric tons of coal in 2016/2017. The United States-based Peabody Energy is the leading coal producing non-state company. Other top global players in coal mining include BHP Billiton, China Shenhua Energy and Rio Tinto. The United States is ranked second in the world for coal production and third for coal consumption. Production showed a slight decrease over the last few years, and reached the equivalent of around 371 million metric tons of oil in 2017. Among the strongholds of U.S. coal mining are the Appalachian states West Virginia, Kentucky, and Pennsylvania, as well as Wyoming in the West. The majority of the top coal producing mines in the U.S. are located in Wyoming. The current rise in global coal production is a result of growing demand and consumption. In 2017, global coal consumption exceeded 3.7 billion metric tons of oil equivalent. In 2005 this figure stood at approximately 3.1 billion metric tons of oil equivalent. Ambitious economic giants China and India are largely responsible for these developments. Some 60 percent of China’s rapidly growing energy consumption is supported by coal. Although U.S. coal consumption has shown a slight decrease in the last ten years, some projections predict a significant increase until as late as 2030.